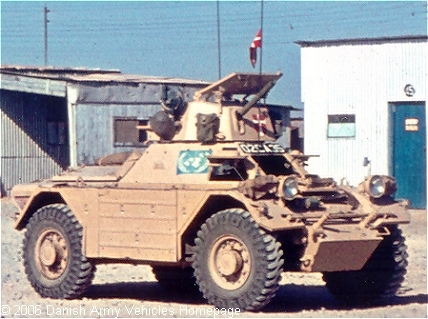 Shown is one the Ferrets operated by the Danish UN-soldiers on Cyprus. The vehicle carried British licence numbers. The Ferret was developed in 1949 as a result of the British Army's need to obtain a replacement model for its Second World War light armoured vehicles. Due to the success of their Reconnaissance Scout Car, the "Dingo", Daimler, was employed to design and manufacture the Ferret. The Ferret shared many similar design features with the Dingo, but featured a larger fighting compartment and a small machine gun turret. It was built from an all-welded monocoque steel body, making the drive extremely noisy as all the running gear was within the enclosed body with the crew. Four wheel drive was incorporated together with solid rubber tyres ("Run Flat"). The turret, though not fitted to all models, carried a single machine gun. Six grenade launchers fitted to the hull (three on each side) carried smoke grenades in British service. It was powered by a Rolls Royce B60 6-cylinder petrol-engine developing 130 hp. It is fast and small enough to be used in an urban environment but strong enough to negotiate rugged terrain off road. The Ferret is no longer in service in the British Army, although several Commonwealth countries still operate them to this day.